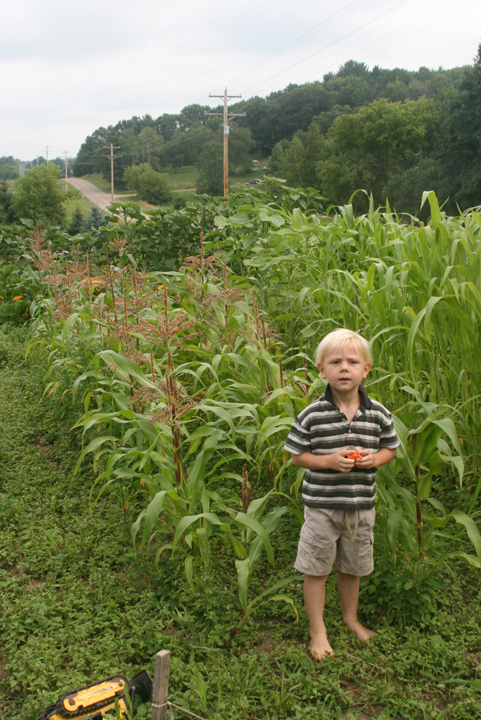 sweet corn | life with three boys and a splash of purple! If we compared our garden to last year’s garden (with a new baby in our family) this year’s garden is awesome! Last year’s garden I had no expectations, whatever got planted, harvested and eaten was a bonus. 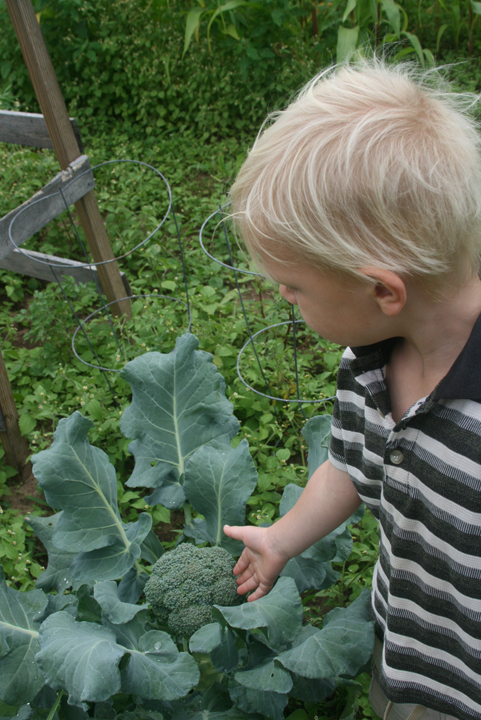 This year I expected a huge garlic crop, lots of sweet corn, lots of broccoli and a small amount of tomatoes. Our planting was a little late due to the long cold spring we had. I had great helpers this year, mainly Henry. We were rushed at times and had many interruptions because of Nola Mae needing a nap or taking a nap or her wandering around in the garden going under or over the roped off rows and pulling out what we planted. 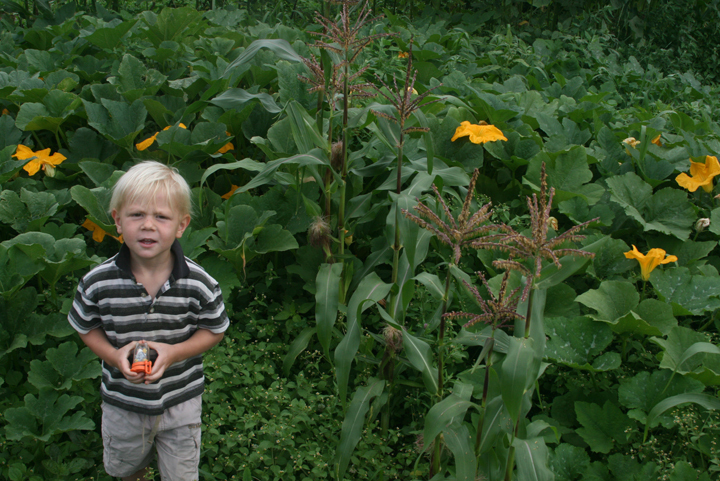 Two 10 foot rows of sweet corn, with tassels when it is as tall as Henry. I had 3 1/2 other rows of corn planted and those seeds didn’t grow. Behind Henry are pumpkin plants gone wild! I didn’t want pumpkins, we didn’t really have room for them and I didn’t want to weed them. 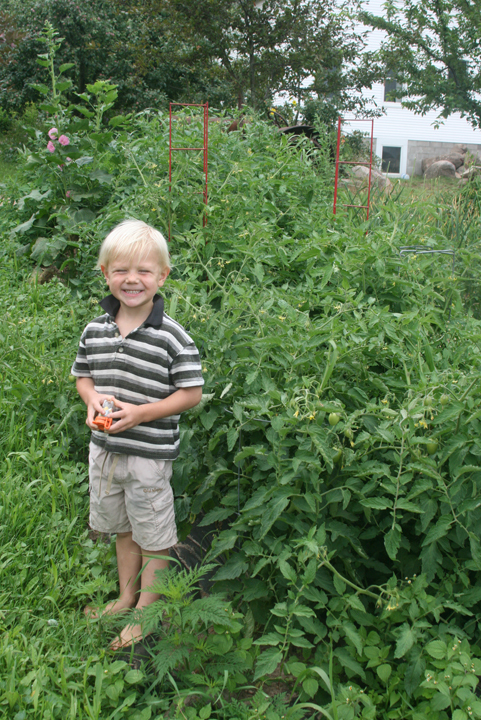 Henry added a few seeds to a little rotting manure pile that I had in the garden that I was slowly tilling in. Too many huge tomato plants. I only wanted four plants. Jack wanted one plant at work, but needed to buy a 4 pack. I went to a green house and they had some discounted plants so I bought another 4 pack. We have a pine snake in my flower beds under the apple trees. That means I am not weeding! My flower beds aren’t so awesome! I know there is one in there, maybe even multiple snakes. The weeds are horrible! Snakes are yucky! Snake story: Last week when we were playing kickball, Robbie kicked the ball right in the flowers/weeds. I took a deep breath and said to myself, “What are the chances that darn snake is right where the ball landed? Just pick it up!” I put one foot on the edge of the weeds and the other foot on a big rock. As I was reaching down to grab the ball, then a snake slithered out from underneath the ball! 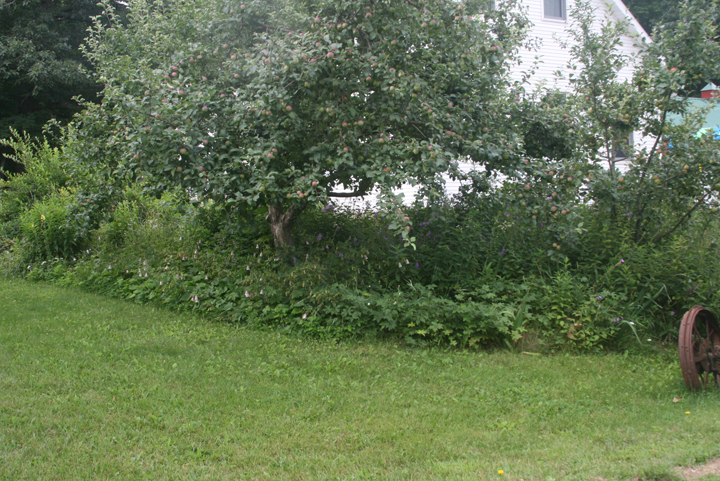 That is when I decided I am mowing the weeds and flowers down when it is time to pick apples. 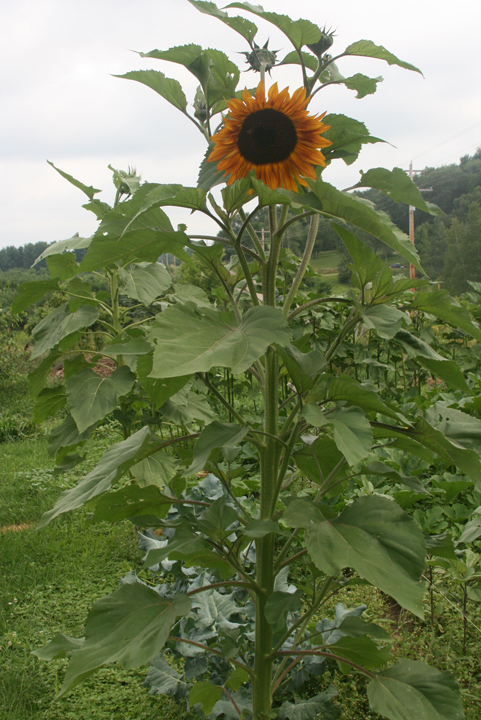 The first sunflower to bloom is a volunteer seed from last year’s sunflowers. I have 12 plants! The chickens got out a few times in the early spring and ate the leaves off two of them. Those plants are making a come back. 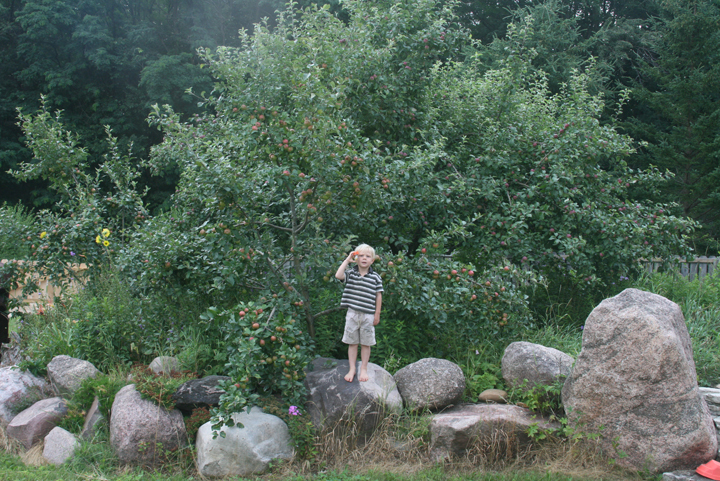 Our apple trees are loaded! 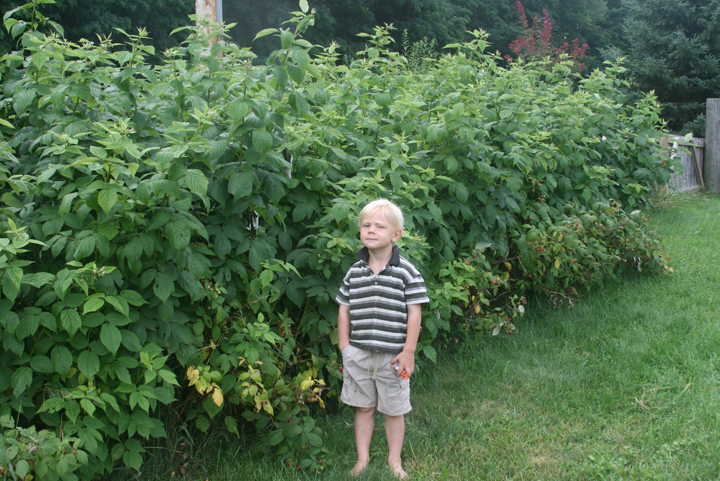 Our raspberry patch is awesome! I am hoping for a very late frost so that we can get the second batch of raspberries this fall. 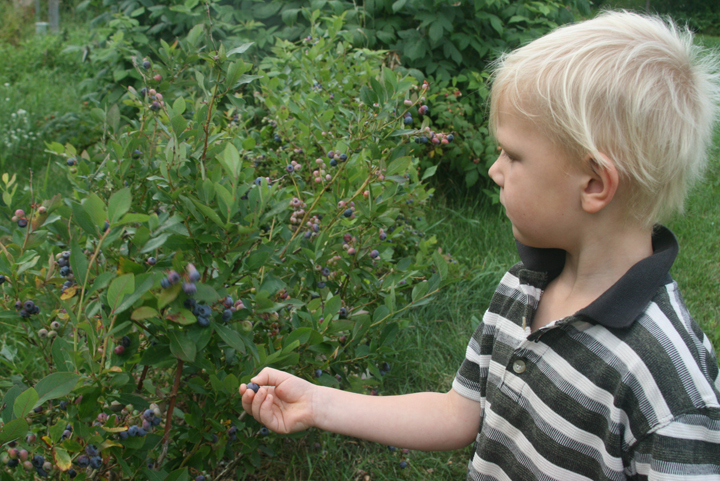 Our blueberry patch is awesome! My phlox free garden is doing well. I have my own comfrey plant, so I can dry my own leaves for my healing balm. 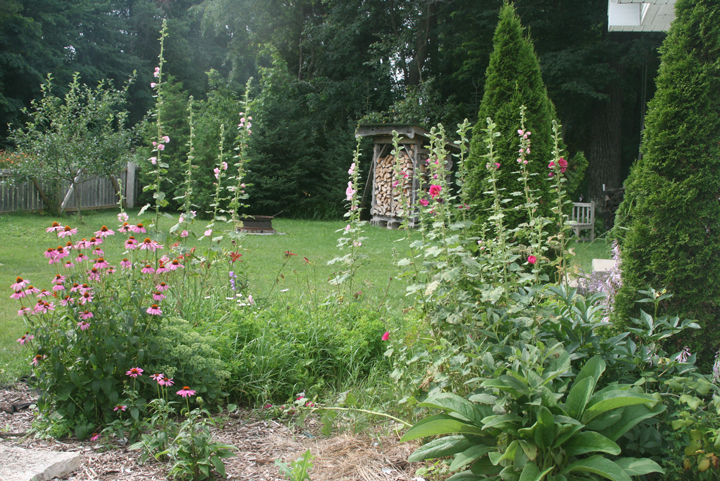 My friend, Kat, introduced me to mullein when I was pregnant with Henry. My midwives reminded me of mullein when I was pregnant with Nola Mae. 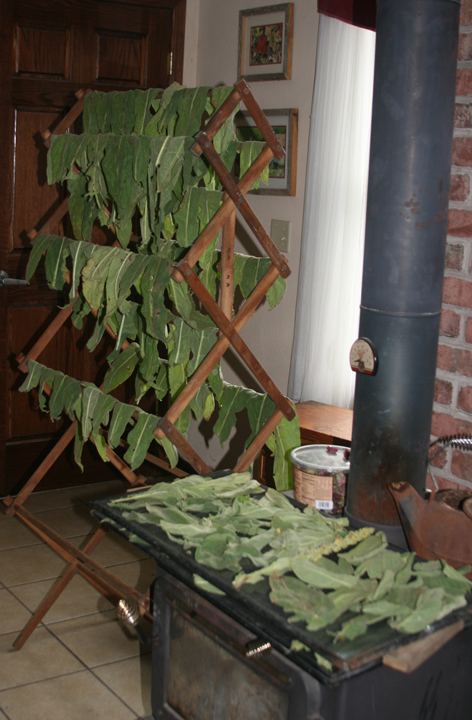 I decided this year we were going to get serious about drying some mullein. My sweet husband has been mowing around my mullein all around our property this summer. Thanks to Henry riding on the tractor with Papa, pointing out all of “Mama’s Mullein” and insisting on Papa mowing around it. This week we picked leaves from three plants. They are drying nicely in my living room! 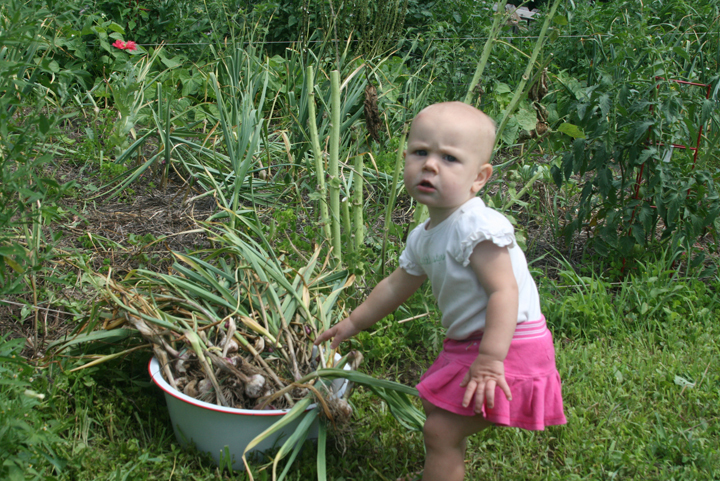 July is the month for harvesting garlic. 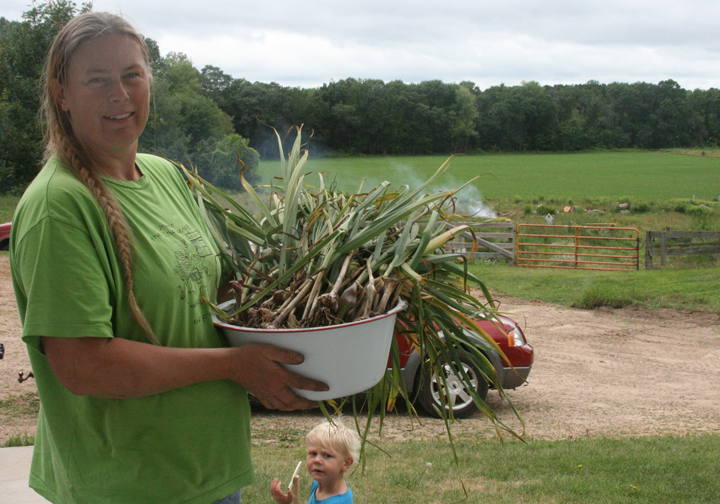 This year was great for growing garlic. I haven’t found my notes from last year to know how many cloves I actually planted. I have about 260 bulbs of garlic. I am almost done harvesting with about 60 more to dig up. Nola Mae woke up from her nap and Charlie brought her out to the garden to me. It was time to stop digging! I don’t need her kind of help this year. 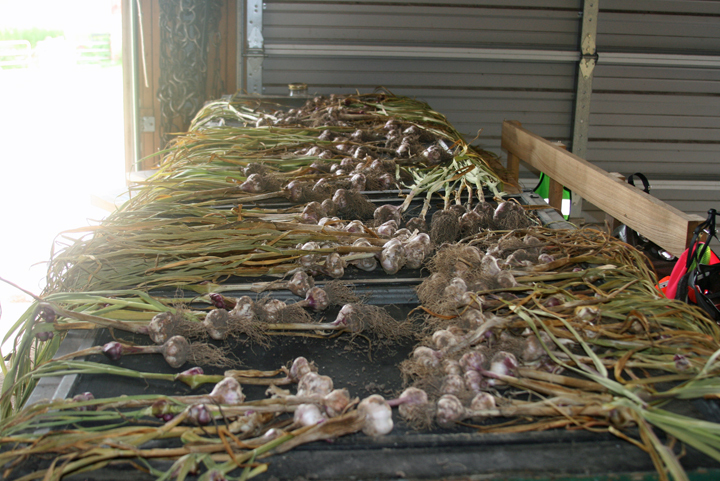 Most of the garlic is drying in the garage, this is 191 bulbs so far. How is your garden this year? What is your favorite thing to grow?